Besides helping to keep a room crisp and maybe making it possible to shut off the money-draining AC, ceiling fans are stylistic and designed for specific purposes. They’re not all the same and it’s best to have a general knowledge of the different types before buying one for a particular area. Some are engineered to be more efficient outdoors than in. Humidity and weather conditions are factored as well. Many colors and forms are produced to match the wide variety of surroundings in which they need to blend. 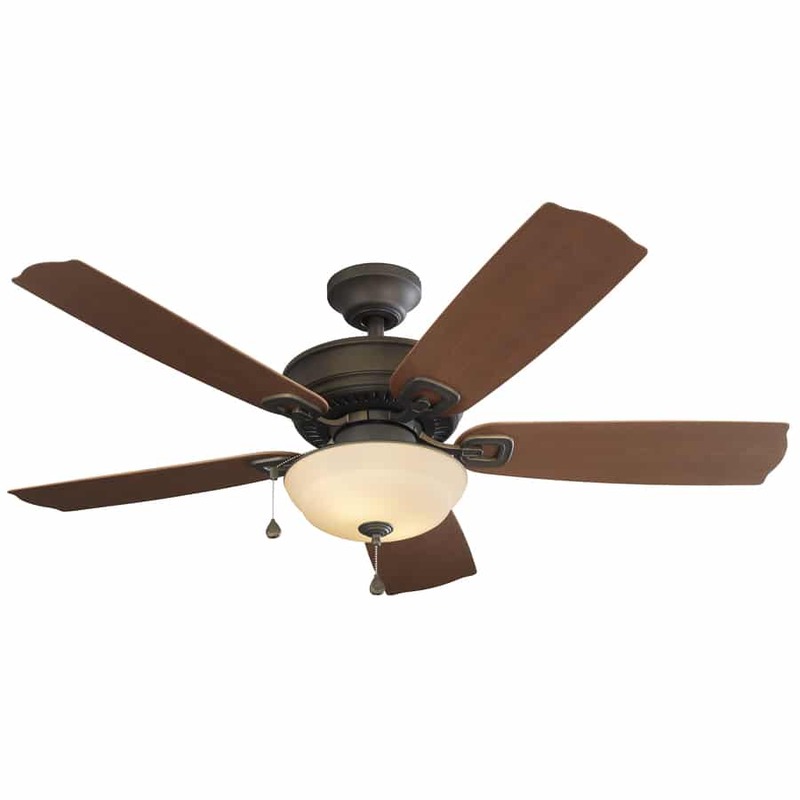 The Standard / Indoor – A standard ceiling fan is what you will typically find in the average home. They are the most popular because they are available in countless designs. It is easy to find one that fits perfectly with a chosen decor. 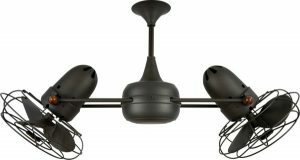 They feature five blades surrounding a light fixture that is covered by a shade (which is also available in a wealth of designs). There are many options to choose from, including a variety of light kits, modified blades, and the choice between a remote control and a pull chain. Its construction features a “down rod”, a metal pipe that attaches the fan to the ceiling, which is typically installed at least 7’ above the ground (a standard room accommodates this). Rooms are typically nine feet tall, in which case the down rod would be 6”, so fans such as these are generally quite effective. Consider that a much larger room with a ceiling height of 20’ would need to compensate with a longer down rod length (which would equate to 72”). 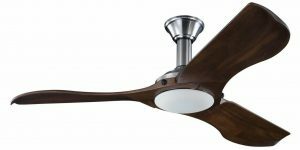 Dual Motors – A ceiling fan that features two adjustable fans, the central motor housing of each is attached to a respective horizontal rod that connects to a singular down rod. This model offers more versatility than most other fans. Each of the two fans may be adjusted at its own speed, pivoted in a variety of directions and are of such unique design they are considered more decorative as well. You will typically find a dual motor ceiling fan used for public use as they are able to cover much greater and specific areas. Naturally, air-circulation is comfortably maximized when two fans are employed. Commercial Use – Speaking of public use, such a setting is most frequently accommodated by commercial six blade ceiling fans. Retail stores, classrooms, coffee houses, eateries, etc… Such rooms range between 10’ and 25’ in height and are often of greater than average width. Sometimes two or more standard ceiling fans will serve in place of a single commercial one. 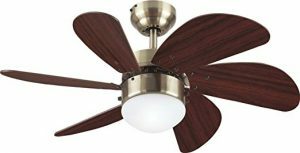 Low-Profile Ceiling Fan – Also known as a “hugger” or “flush-mount ceiling fan”, a low profile fan is designed to cool a room that has a short ceiling height of only 8’ or less. In the absence of a length-extending down rod, the fan is instead connected directly to the mounting bracket (thereby facilitating the 7’ height minimum) and features only three wide blades. Air circulation isn’t as effective so close to the ceiling, but it is a perfect accessory to AC that is generated from another room. Like their counterparts, low profiles offer a variety of customizable options. Energy Star Certified – Since being ‘Green” (environmentally conscious) is so important to everyone, Energy Stars are made in both Standard and Low Profile varieties and can conserve cash while being naturally beneficial to its surroundings. In order to be ‘Energy Star-Certified’ the model must use 20 to 30% less energy than its other fan counterparts. Much testing was implemented in the design process, and has since proven economical with minor adverse impact on the environment. They use efficient motors and aerodynamic blades. Include integrated lights and one may increase energy efficiency by as much as 30%. Outdoor – Particularly in rustic conditions, damp or wet ceiling outdoor fans work best. Featuring four all-weather blades that will not warp due to humidity, their motors are also weather resistant. Damp ceiling fans are most found in humid areas such as covered porches, patios and sun rooms. In the case of exposed porches or gazebos, wet ceiling fans are employed. They, too feature weather resistance unaffected by moisture and humidity. Damp ceilings cannot withstand rain or snow, but wet ones can. Naturally, there are fans designed for the large needs of industrial areas as well agricultural uses such as in barns. Nearly all ceiling fan models provide a remote control option. It is known that not every user may be tall enough to reach a pull chain. That’s why it was important to offer the push button advantage, which also lets you tweak variables such as fan speed and in some cases, light dimming. In all instances, the type of room must first be determined before choosing a fan. Naturally, the size of the space will directly reflect the size of the fan needed to cool it. When figuring fan size, remember that a 52” fan can cool up to 400 square feet, while a 42” fan can comfortably circulate the air of 144 square feet. A little math is helpful in such scenarios. So what’s cool about keeping cool with ceiling fans? No matter what style you choose, if you do so properly, it will perform its primary function of cooling temperatures… to preferred degrees!